UP Police Recruitment for 49578 Police constable posts in the various District all over UP State. This is really a big opening for all fresher candidates to grab a Government job in India. Today on 18th November 2018 UP Police Department issued an official notification in which they said that they are going to filled up the vacant positions of constables in various Police station. 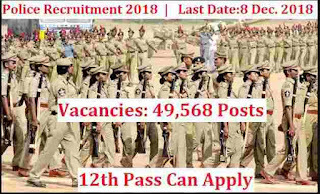 UP Police Recruitment Department said that the process for applying this Police department recruitment process will be online and the link for applying online will be activated on 19th Nov. 2018. All these information mentioned inside the official PDF file shared by the department. On the basis of that PDF file we are sharing this information with you readers. The official PDF file is in HINDI Language only. More information which we extracted from that PDF file is given below in this article. We share each and every prospective related to this Police department recruitment below in this article. So read it through out to know more about this Police department recruitment process 2018. In the table below we are going to explain the various vacancies according to the cast category which are going to be filled up through this Police Recruitment process. Candidates have to apply according to their cast only with a valid proof. Check the table below for more information related to the vacancies according to the various cast categories. Now before applying these Police constable jobs one should know the criteria for applying so in the table below we explained about the various factor related to the eligibility criteria. Candidates who satisfied these eligibility criteria can apply for this Police Department recruitment process 2018. Check the table below to know about the various eligibility conditions. 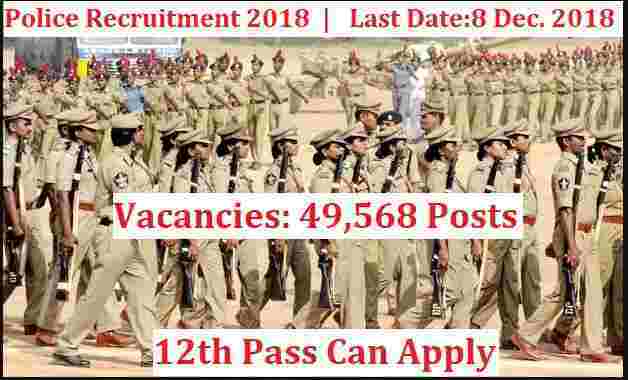 All Indian applicants who have passed in their 12th Class examination from a recognized education board of India can apply for this Police Recruitment process 2018. There are various physical Eligibility criteria which candidates have to be satisfied before applying online. So check the table below to know the conditions,. So those who satisfied these physical eligibility criteria can apply. The Police department decide to take common application fee from all categories candidates. There is no fee reeducation for reserved category candidates. All the Applicants have to pay Rs.400 as their application fee. Paying Method: Candidates can pay the examination fee through the following ways: “ credit card/ debit card/ net banking/ E challan Fee mode”. You can choose any one of these methods for the payment of the application fee. 8th Dec. 2018 is the Last Date to apply.